Captain Makely was captured July 8, 1863 near Hancock, MD. His company was foraging for provisions for its horses while acting as the rear guard for Lee’s army retreating from Gettysburg. He arrived at Johnson’s Island a week later and remained there for the rest of the war. During his 19 months of confinement, Makely endured a confinement typical of most of the officers there. Johnson’s Island was unique. It opened in April 1862 and was the first Union facility designed specifically to be a prisoner-of-war camp and the only one set up strictly for officers. More than 10,000 Confederate officers passed through Johnson’s Island during the war; when Captain Makely arrived there were less than 1,000. 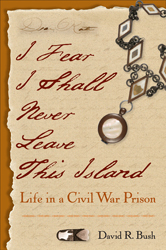 For readers used to reading about the horrors of Andersonville, Camp Douglas, and Elmira, Johnson’s Island might sound like Club Med. Mail was sent and arrived with remarkable regularity; men could receive food and clothing packages sent from relatives; the captives participated in a thriving industry making rings and other trinkets for themselves and outsiders; and their wardens, men of the 128th Ohio, were relatively humane guardians. Bush manages to bring both Captain Makely and Johnson’s Island into clear, albeit stark, relief.